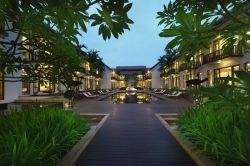 This luxury retreat in Siem Reap is only a 10-minute drive from the Siem Reap International Airport, the Angkor Archaeological Park, and the Central Market. This is the only resort in Cambodia that offers a highly acclaimed butler service in all of its studios and suites. The hotel’s breathtaking landscape is the result of its stunning garden and water features as well as architectural design that harmoniously combines a contemporary resort design with subtle images of traditional Cambodian art. Each of its 39 studios and suites is well equipped with modern amenities. At the hotel’s restaurants and bars, guests can choose from classic international and traditional Khmer cuisines while enjoying live music. To de-stress, guests have access to gym facilities, a movies library, or The Spa Apsara which offers spa suites for couples, organic-based treatments, traditional massages, and a special yoga program. Those who prefer outdoor fun can opt for a tailor-made travel and helicopter tours arranged daily by the hotel. Anantara Angkor Resort is a perfect sanctuary for all travelers.